While I've tried following the XCAsset documentation, it refers to removing some tvOS directories for iOS submissions. Those directories don't exist in the builds I've looked at. ERROR ITMS-90513: "Missing Info.plist Key. Your app's Info.plist must contain the 'CFBundleIcons.CFBundlePrimaryIcon' key." ERROR ITMS-90513: "Missing Info.plist Key. Your app's Info.plist must contain the 'TVTopShelfImage.TVTopShelfPrimaryImage' key." ERROR ITMS-90513: "Missing Info.plist Key. Your app's Info.plist must contain the 'TVTopShelfImage.TVTopShelfPrimaryImageWide' key." The build.settings are as follows. I've tried this on both build 3162 and 3184. You are entirely missing the (Apple) tvos section and I assume the assets too. Edited by roaminggamer, 17 December 2017 - 05:07 PM. I did refer to an older app I put on Apple TV but that didn't have any of the xcassets. Cannon however appears to be a good reference! I'll chase that rabbit and see where it gets me. This looks like it has what I"m missing. I think perhaps the Apple docs update simply slipped through the cracks with the many things going on at Corona. Edited by roaminggamer, 18 December 2017 - 05:23 PM. My comment about tvOS wasn't aimed at Corona, but at the developer side. The tvOS forum here is very quiet, the ad providers dropped support for tvOS which IMHO is likely due to lower ROI on the platform. Lack of monetization options may in turn have developers steer away from the platform too, and it becomes cyclical. Sure there's other ways to monetize, but advertising is a major player currently. I'm asking for a clarification on the documentation and we will get it updated with a more complete example. Try building SampleCode/Physics/ShapeTumbler. It has setup for tvOS submission. I'll check it as well. EDIT: Submission of that sample to app store worked perfectly, got green checkmark and everything. Please, use it's build.settings tvOS section and Images.xcassets as an example. It is little different to include all the tvOS assets. Corona Cannon got the job done, I'll check out details for Rob on the documentation side. Thanks for the tip though Vlads, I'll check that out too just as a learning exercise. Per the two articles referenced above, there isn't a lot of mention for tvOS. For Apple's tvOS, several unique icons and assets are required. Please see the Managing Xcode Assets guide for a reference on the Images.xcassets folder and how to include/reference it within your app. If no tvOS release is planned, you can delete both the AppIconTV.brandassets and LaunchImageTV.launchimage folders within the Images.xcassets folder. This will not affect how icons are generated for iOS. Under Managing Xcode assets, I don't know that these assets ( AppIconTV.brandassets and LaunchImageTV.launchimage folders) are still included as I don't see them any more. After searching the documentation, I don't see any reference whatsoever to a tvOS section in build settings (like I quoted above) so I wasn't aware I should have included it. Naive perhaps, but I wasn't able to find anything pointing that out . It explains why I was having so much trouble though. Hope that helps, and if there are other areas I missed that I should have read, I'm happy to be educated. Hey, graham07. 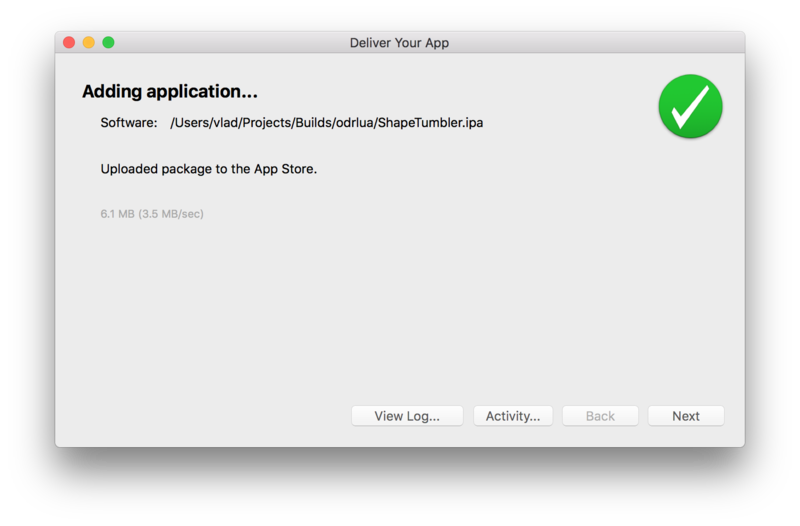 You can use /Applications/Corona-3184/SampleCode/Physics/ShapeTumbler/Images.xcassets as a template for all tvOS assets. That's it. That is all there is for it.